Pupils at a primary school in South Africa have three new classrooms thanks to some heavy lifting machinery from De Beers Group’s Venetia mine. 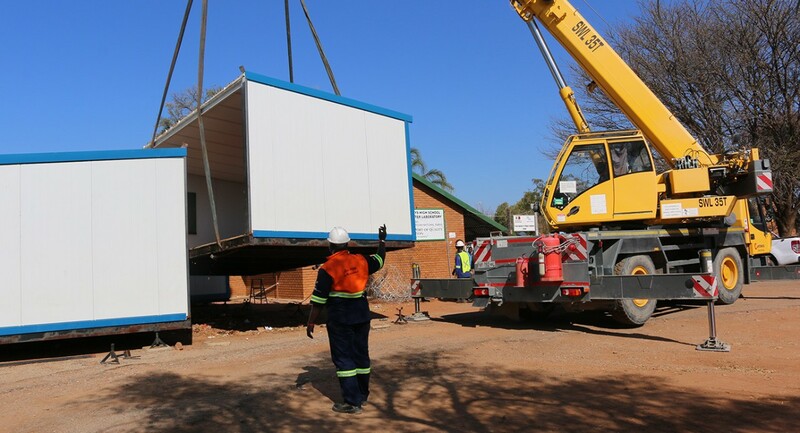 The mine sent in a lowbed truck and crane and partnered with local contractors to transport unused mobile classrooms from Alldays High School to the nearby Alldays Primary School in Limpopo Province, saving the school R150,000, which is what it would otherwise have cost to move them. The move took three weeks – because it had to be fitted in between operations at Venetia mine. Before these new classrooms arrived, 105 grade 5 (aged 12-13) students at Alldays Primary School shared a single class, and others in the school shared similarly crowded classrooms. Now class sizes at the school, which has about 1,000 pupils, have been reduced to just over 50 children per class.